Young Ambassadors from Gazprom’s International Children’s Social Programme, Football for Friendship, were at the Dragão stadium in Porto on Wednesday to present the Brazilian National Team with the Nine Values Cup. 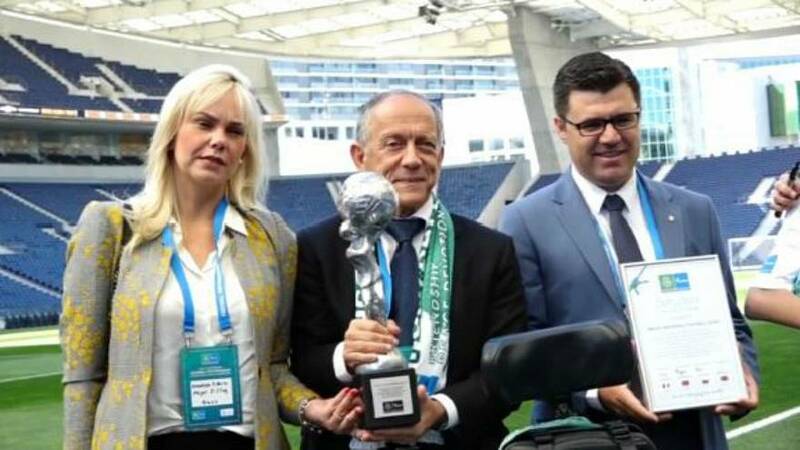 The Secretary General of the Brazilian Football Confederation Walter Feldman and the Manager of Technical Development and Social Responsibility of the Brazilian national football team Diogo Netto were told by the young representatives about the history and meaning of the trophy. What is the Nine Values Cup? Friendship, equality, fairness, health, peace, devotion, victory, traditions, and honour. The Award Ceremony of the took place on the threshold of a friendly match between Panama and Brazil. Who are the international ambassadors? Swan Drame (13 from France), Catarina Barata (13 from Portugal), Miguel Borges (19 from Portugal), and Denis Aladev (13 from Russia). The Brazilian national football team won after an open vote where the young participants from 211 countries and regions of the world took their part. The Football for Friendship participants have acknowledged the Brazilian national team as the most socially responsible from the 32 national football teams that participated in the FIFA World Cup 2018 in Russia. Brazil is the fifth winner of the Nine Values Cup after Barcelona (Spain), Bayern Munich (Germany), Al Wahda (Syria) and Real Madrid (Spain). The International Children’s Social Programme Football for Friendship has been implemented by Gazprom since 2013. The main values promoted by the programme participants are friendship, equality, fairness, health, peace, devotion, victory, traditions, and honour. Its participants are young players, male and female, as well as those with disabilities. Moreover, young journalists covered the events in the International Children’s Press Centre. The final events of the Football for Friendship programme will take place in Madrid from May 28 to June 2, 2019. Feldman described the award as a “great honour." "In Brazil we are launching a very important programme in the whole country contributing to education via football. Our program is called “CBF Social” and we will put this program in all cities in the whole country. So we are linked with this proposal and this Football for Friendship programme. We will probably use the meaning of this meeting to bring more values to our programme,” he added.